area, Fort Canning Park is one of Singapore's most historic landmarks. The 18-hectare park is delimited by Hill Street, Canning Rise, Clemenceau Avenue and River Valley Road. 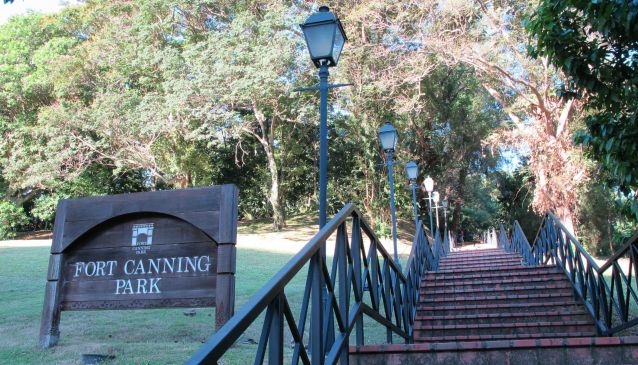 it has seen when the Malay Kings ruled from its peak to witnessing World War II, where the hill played an instrumental role in the war efforts and military building located at what is now Fort Canning Park. You are able to visit the building where the British surrendered Singapore to the Japanese, which is now the Bunker or Battle Box. For history enthusiasts, the 14th century kingdom of Temasek has been recreated and is featured in the virtual game World of Temasek. Once where war was had, now lives a lush lawn where concerts, theatre production, festivals, picnics, weddings and much more are regular events and charm remains. Today Fort Canning Park offers 9 events venues including the popular Fort Canning Green. Join on several seasonal guided walk to embrace nature and revisit history with friends and family. With several on-site attractions such as The Keramat Iskander Syah, which translates to 'a scared place' in Malay and is the time-honored burial ground for the honored leader. The Archaeological Dig and Exhibit where thousands of artifacts have been discovered proving several historical significances. The Parit Singapura, also known as the 'Moat of Singapore' once a fresh water stream since has completely dried up and disappeared and onlookers can see where this trench was related to the ancient moat. The Singapore River Stone, which is linked to the infamous 14th Century strongman named Badang. As the story goes, he was to have thrown the stone from the audience hall of the King at Fort Canning Hill to the mouth of the Singapore River. Visit the several other attractions of the Fort Canning Park today to enjoy the serenity and beauty as the Malay Royals once did.